While the U.S. Navy’s Blue Angels are famous for their terrific aerial maneuvers, it turns out the elite flight demonstration pilots need the same on-the-ground legal services as the more earthbound among us. Claire Ford ’68 found this out firsthand, working as an attorney in the Navy Judge Advocate General (JAG) Corps in the 1970s. Ford’s journey to the Navy JAG Corps began in New York, where she was born and raised. She completed her bachelor’s at Manhattanville College, where she majored in political science. “I was always interested in and very involved in New York government and politics, and it seemed as if a law degree was the best credential for going in that direction,” she said. To that end, Ford decided to enroll at Fordham Law School. As a law student, she kept busy: she chaired the Law Forum, a group that planned lectures and debates for the Law School community; was a first place finalist in the I. Maurice Wormser Moot Court Competition; and served as a member of the legal staff of then-mayor of New York City, John V. Lindsay. After a stint in a personal injury defense firm upon graduating, Ford pivoted to a career in the Navy. Her first duty station was the naval base in Newport, Rhode Island, where she went to JAG school. Ford was then assigned to the naval air station in Pensacola, Florida, where she met the Blue Angels and served as assistant judge advocate to the chief of Naval Air Basic Training. “Certainly being the only female JAG officer at the Newport Naval Base and also at NAS Pensacola provided me with opportunities to meet many senior officers, tour battleships and the outstanding aircraft carrier USS Lexington, and attend events that I am confident never would have been accorded to me if I had not held the unique position that I did,” she said. Ford’s Navy career was soon cut short. Within one year of getting married—she met her husband, also a JAG officer, in the Navy—she became pregnant. At the time, the Navy did not accommodate pregnant women, and Ford had to step down. After spending some time away from practicing law to raise her four children, Ford returned to the legal profession in 1986. She spent several years at Spence, Payne, Masington, Grossman & Needle, P.A. in Miami, where she worked in personal injury and medical malpractice litigation. Later, she started her own firm while also establishing an of counsel relationship with the Law Office of Roberto Villasante in Coral Gables, Florida. 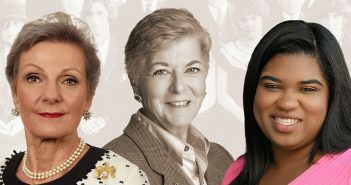 During the 2018–2019 school year, Fordham Law School is celebrating 100 Years of Women.